Fry off or roast some red and yellow peppers with a couple of sliced onions and keep them in the fridge. Spread a wrap generously with soft goats cheese, strew with the peppers, a little freshly chopped mint and rocket leaves and roll up, slice in half and wrap. (The cooked peppers and onions keep for 5 days at least, well covered, in the fridge. Chop up a packet of chicken tikka pieces and stir through a little tzatziki and fresh mint. Spread a little mango chutney on a wrap, top with the chicken mix and a few salad leaves. Roll, slice and wrap. Homous, shredded left over roast lamb and mâche lettuce are delicious in a wrap. You can substitute shredded carrot for the lamb to make it vegetarian and vegan. A tin of well drained tuna and a finely chopped stick of celery, mixed with a really small amount of mayonnaise, lots of freshly ground black pepper and lemon juice can be put in a container along with a handful of cucumber slices and buttered bread of your choice. Assemble just before eating. Eggs are a soft in texture and benefit from something crisp and salty on top. I had mine with salmon but Jake had his with crispy fried turkey bacon and it was a much nicer contrast in textures. 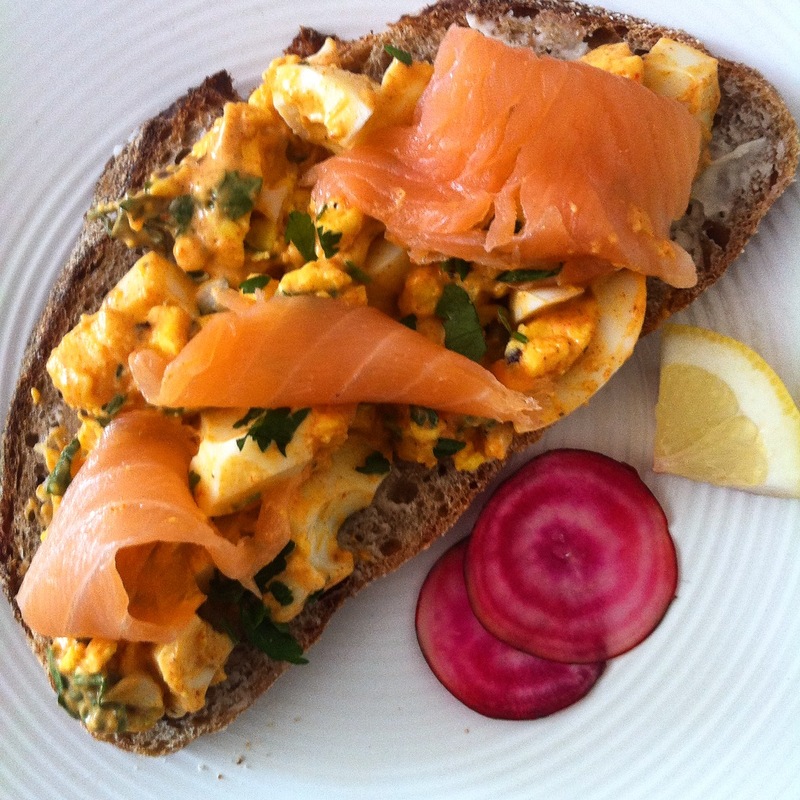 The sharp, lemony beetroot or radish slices make a welcome contrast to the richness of the eggs. This is the crumb shot of my home made sourdough loaf made with my starter, Twinkle. ¼ – ½ tsp cayenne pepper – adjust this to your palate or leave it out if there are young children involved. thinly sliced raw chioggia beetroots or radishes, tossed in a little lemon juice and salt. Place the eggs in a small lidded pot and cover with cold water. (If the eggs are fridge cold, cover with tap-hot water for 5 minutes then drain. The shells will crack otherwise) Place over medium low heat and bring to a boil. Let them boil for 1 minute then remove from the heat and let them sit, covered in the pot for 9-10 minutes. Drain and fill the pot with cold water to stop them cooking any further. Crack the shells (I give the fat end a bash in the sink) and put back in the cold water. The water gets between the membrane and the egg and makes it very easy to peel. While the eggs are cooking; 1. Put the shallots or bacon or chorizo on to fry. 2. Whisk together the mayo, smoky paprika, cayenne, salt and pepper in a medium sized bowl. 3. Slice the chioggia beetroot or radishes as thinly as you can and toss in lemon juice. 4. Chop the parsley/chives. Chop the boiled eggs (smaller that in my photos as they are less likely to fall off the bread than chunky pieces) and stir into the mayonnaise mixture together with the parsley/chives. Taste and adjust seasoning if necessary. I don’t like too much mayonnaise but feel free to add more if you like your fillings creamier. Butter the bread and top with the eggs and crispy topping of your choice and a few slices of the lemony chioggia or radish slices on the side. 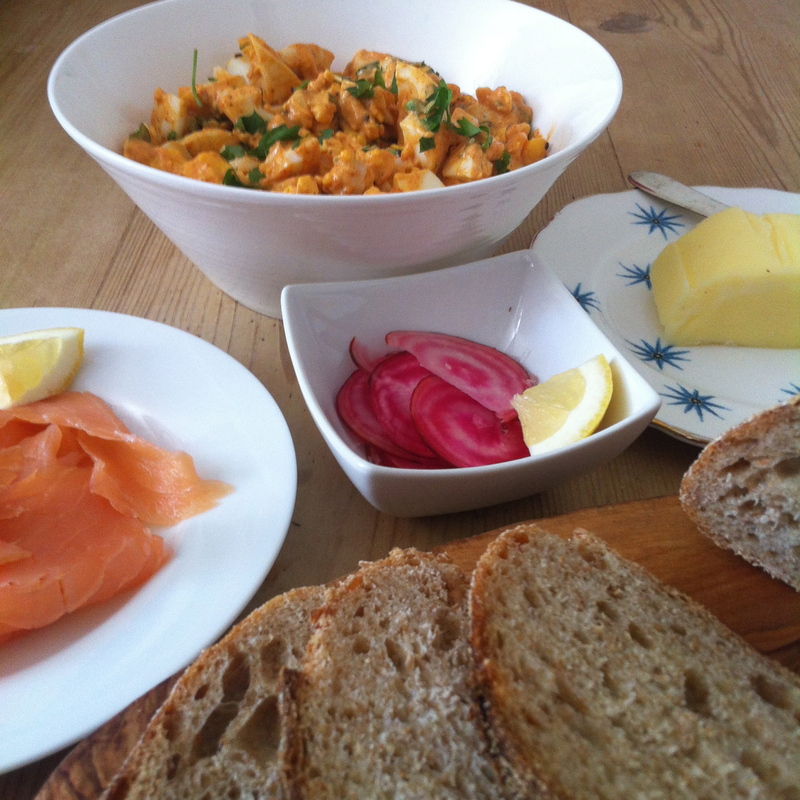 This entry was posted in A Selma's Table Original, Lunch Box, Recipe and tagged eggs, lunch, lunch boxes, lunch ideas, Lurpak, quick, smoky paprika. Bookmark the permalink. Love it Selma, I have some sour dough rising right now. Have some good bacon and eggs, this sounds like exactly what I need to make when that bread is baked. Your loaf is gorgeous. Thanks Suzanne – I know it’s a really simple recipe but It took me ages to get it right. Eggs over cooked (grey around the yolk), cracked shells, then, too much mayo, not enough mayo, too much cayenne and so on!! 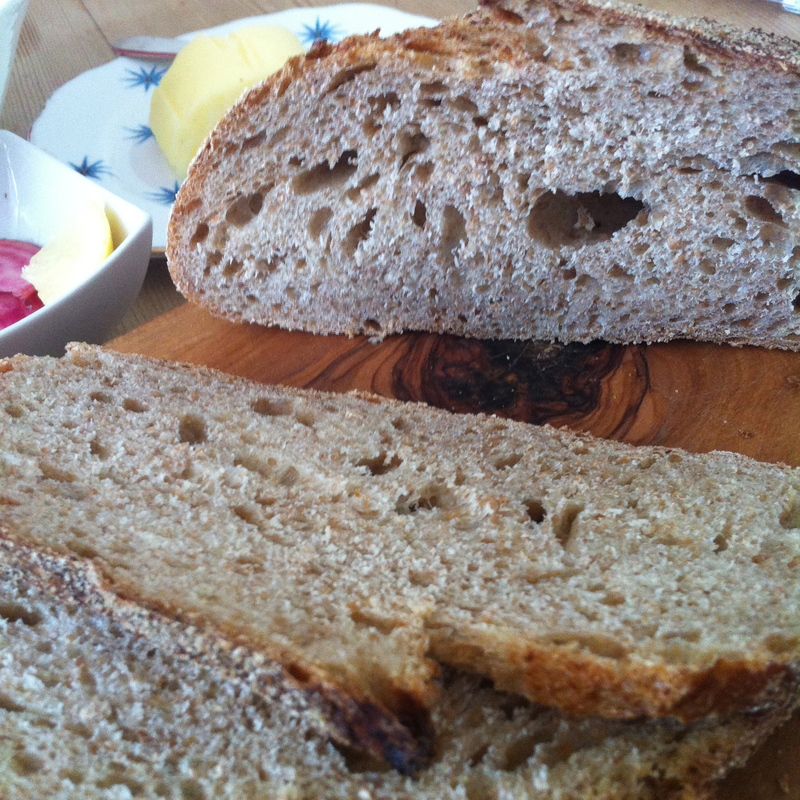 Glad to hear that your sourdough is still going strong – I’ve got to get another batch on! I eat different things every day, being one of those food bloggers on Instagram, but Graham and Ben do tend to be those creatures of habit you mentioned…! However much I try and change things up!! You are welcome – it’s a great recipe so thanks for sharing it! Twinkle is doing really well with the loaves – each one gets better and better! This is an all day menu Selma. I can have eggs and toast all day along. Love them on sourdough. I still have to use the one that you sent me. I am in the middle of move, so once settled will use that. I saw on FB that you are moving to Texas – that will make a bit of a change, weather wise!! When you do get a chance (and there is no rush) to revive the starter, just keep an eye on it as the weather will be so much warmer in your new State! Good luck with the move Sonal, though I am sure that with your organisational prowess, it will go very smoothly! I have lived in Texas and it’s quite dry and humid. Can’t wait to move since it is a desired move. We love the culture and food there. I am takin the starter in my personal belongings rather than sending it through movers n packers. Those are some gorgeous sandwiches Selma! I live in the land of Lurpak, hehe! Oh, of course you do Naina! It’s probably flowing through your veins! 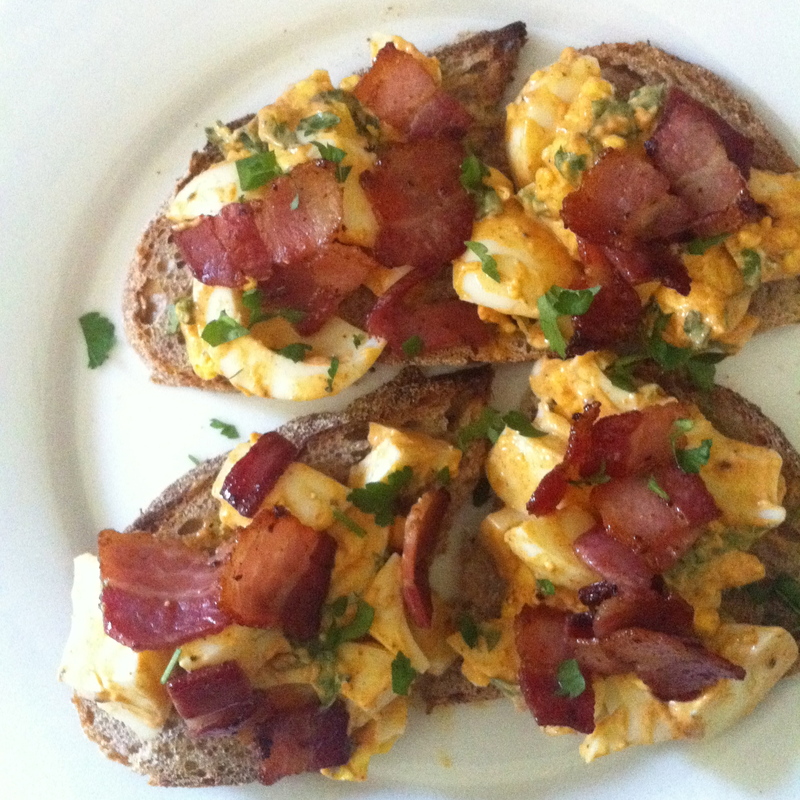 Thank you Kloe – I love an egg sandwich and this one is so tasty! Thanks SKD – I love looking forward to my packed lunch! Thanks very much – the sour dough has just become part of my weekly routine now! I would like some of those right now! It was very good – wish I could have shared it with you! Yum! I looove eggs any which way, add a touch of mayo and they’re blissful. You bread looks truly amazing! Thanks Sandra – Priscilla is a very good mother – I still stare in wonder when I pull a loaf out of the oven! I could eat this any time of day! Your bread is beautiful! Wow! This looks so delicious! I can’t wait to try it out! Thanks – hope you like it! I take my lunch every day, creature of habit, I cant get past salad, avocado and tofu, or smoked salmon, or trout. I dislike bread every day however I like the sound of your fillings and taking the filling in a separate container. The bread looks yummy in your photos. Thanks so much Robyn. I think we become creatures of habit just because it’s easy and something we don’t really have to think about. But whenever I have something new for lunch, I usually cannot stop thinking about it and eat early – which just goes to show that a little sandwich filling change now and then is good for the soul! Thanks Jhuls – lots of eggs here for you! I am well, hope you are too? Looks beautiful! This open faced sandwich with a lovely topping is tempting. I have not made sourdough bread…I think it is time to try! Making SD bread is so easy once you get going with it – give it a go – you will be so surprised! I would love one of those slices of bread this morning for may late breakfast! 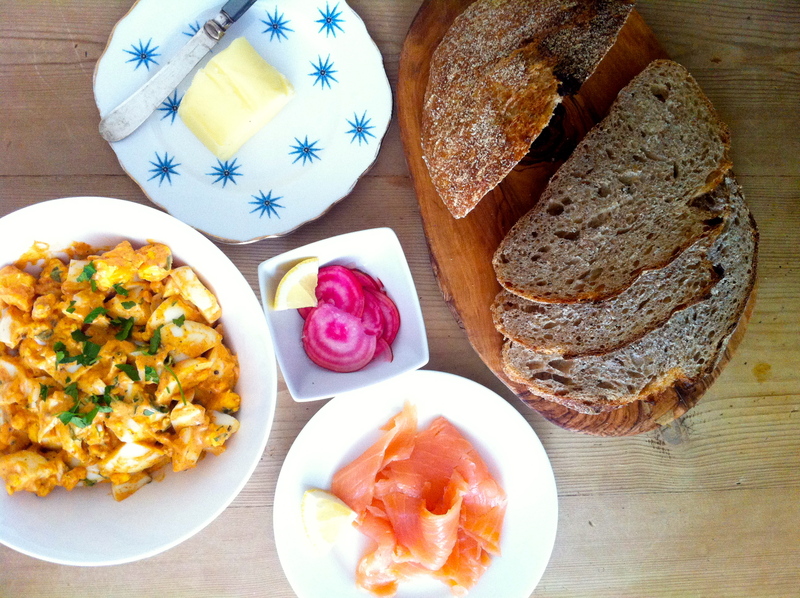 Yum, I love devilled eggs, and your sourdough is looking fabulous Selma! Thanks Beck – it is something I love making. Thanks Karen – I think packed lunches should be something to look forward to. Hi Selma, I’m not a salmon person, but as for the rest of the ingredients of this deviled eggs on bread, I love it! Thanks Fae! Jake had his with turkey bacon and really enjoyed it but to be honest, it is fabulous on it’s own. Would make a great sandwich filling for an English style picnic! Great recipe; I am one of those food bloggers who only really eats interesting food at the weekend as during the week I run out of time. I am always looking for new sandwich fillings. Hello Marita! I used to always make nice sandwiches for Jake’s lunch so this is something that I really know about! if you have pesto, sundried tomato paste, mayo, cream cheese or homous in the pantry, plus left over roast meat and salad leaves – it’s so easy to put something delicious and lovely together. This has been such a popular post that I think I might do one on non-sandwich lunches that are quick and easy…hopefully we will all get inspired by our High Society Tea next month!! Do you mind if I quote a couple of your articles as long as I provide credit and sources back to your blog? My website is in the very same area of interest as yours and my users would really benefit from a lot of the information you present here. Please let me know if this okay with you. Regards! Dear giromarara – unfortunately and so sadly Selma died in 2015, leaving a college son. I think she would be honoured if you kept her recipes, and her kind and lovely spirit, alive.